Dialects: Different from Dogoso [dgs], Dogosé [dos] in Burkina Faso. Auteurs : Hochstetler, Lee; Durieux, J. 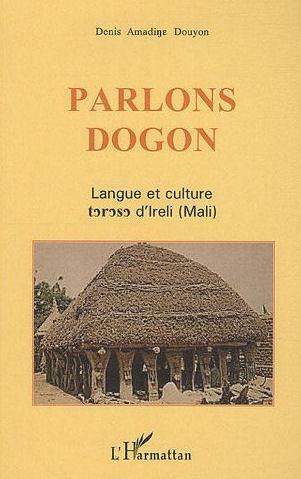 A.; Durieux-Boon, E. I. K.
In 1998 a sociolinguistic survey was conducted in the Dogon language area in central Mali to assess whether all Dogon speakers could potentially use literature published in the Toro-soo speech variety (the Dogon variety selected by the Malian government to be the sole standard). If not, then which speakers of which speech varieties would have trouble understanding it? To what degree might these Dogon speakers benefit from literature in Bambara and Fulfulde? Or might further linguistic analysis and literacy work be needed in other Dogon speech varieties in order for all Dogon speakers to have access to a literature they could understand? 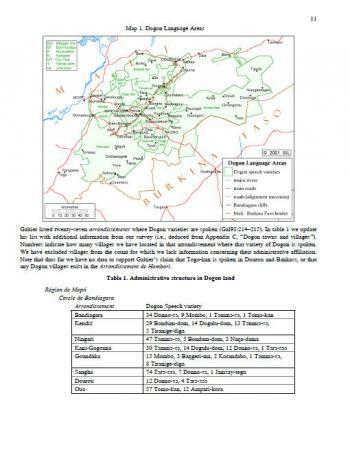 This research included identifying the Dogon speech varieties, listing villages where each is spoken, mapping the geographical area of each speech variety, collecting wordlists, and asking questions following a standardized questionnaire. 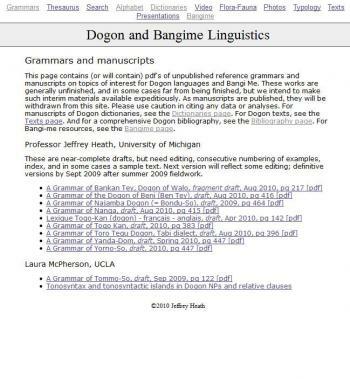 This is the website for a project on Dogon languages, also including the Bangime language (a language isolate spoken by a culturally Dogon group). The Principal Investigator is Jeffrey Heath of the University of Michigan. Other fieldworkers are (or have been) Kirill Prokhorov, Laura McPherson, Abbie Hantgan, and the late Stefan Elders. Principal pôle touristique du Mali, le pays dogon est mondialement connu. La culture dogon est le fruit de la construction de plusieurs langues. L'auteur choisit ici de présenter l'un de ces parlers, le ireu-tin. L'ouvrage comprend une description de la langue au plan phonologique, morphologique et syntaxique ; une présentation de la culture et du vécu quotidien de la population et enfin des textes de conversations dans des situations conventionnelles. Un lexique dogon-français et français-dogon complète l'ouvrage.